Here is an interesting style you don’t see too often that brings new meaning to the word “chamfered”. 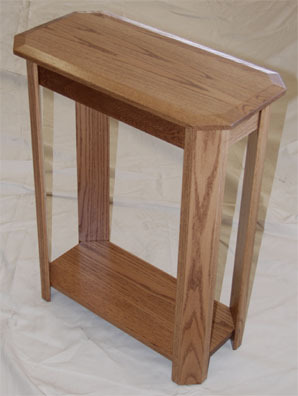 Our Amish made clipped corner living room table, beautifully designed with chamfered edges on the top, and the legs. The legs are also at the same angle as the clipping of the top and bottom, which serves to accentuate the overall style of the table. Even better, this is just a sample! There are more tables in this style - a sofa table, and also smaller sizes that could be used for end tables. This one is the perfect size for the hall, or as a window table. If you are interested in doing your living room in this style we can provide you with pricing and measurements of the other tables too.